When T was small he loved baths, being born with a full head of hair meant that he soon got used to having a bath and hair wash until he reached about 18 months that is! Then overnight, bath time became a drama and hair washing turned into a scream-athon! So in an effort to 'entice' T into the bath, I stopped trying to bath him every night and just bathed him 2-3 times with a few showers in-between if he could be persuaded in! 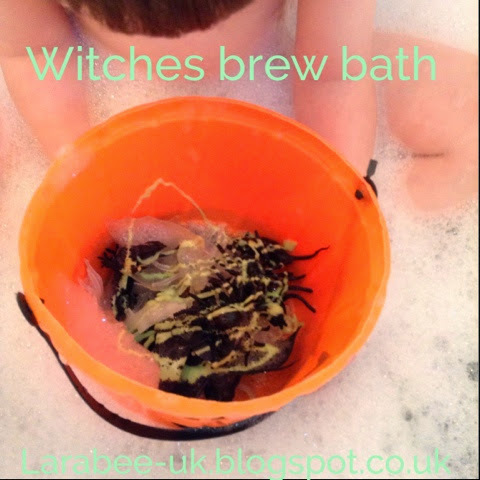 I also started to make baths more fun and more of a play time than wash time. Now I know that to some may turn their nose up at this and I'll be honest I would rather a nice clean Johnson's smelling toddler but it's just too stressful, so we compromise. Anyway back on topic... 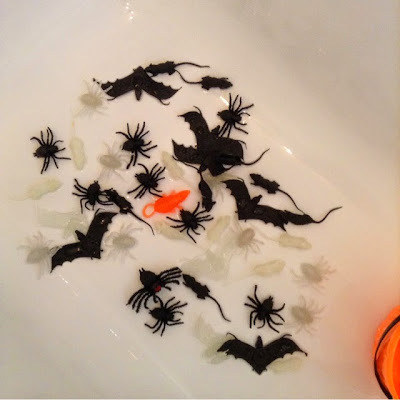 I tried to make his baths more fun for him. 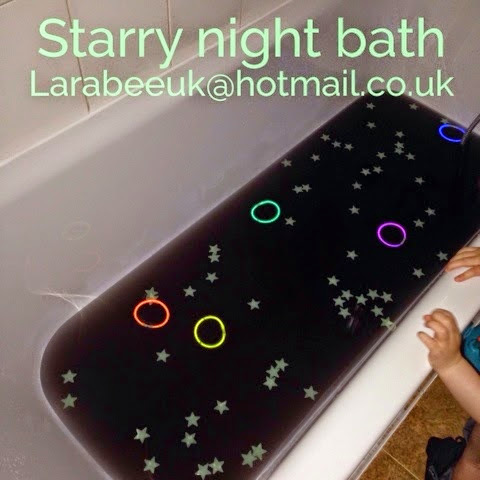 For this bath I added half a bottle of black food colouring - this one was a natural one and useless for colouring bath water - it was barely grey. I'm done with Liquid food colouring for our play and activities, from hereon in I'll be using E number heavy pastes! With a very cheeky grin and poured his potion into the bath. We then tried thinking of other spells but he got bored very quickly, so we turned off the lights and hunted for the glow in the dark creatures. I was surprised how long this bath kept him entertained. We even managed a hair wash using our new 'ice bucket challenge' method of tipping an entire bucket of water over his own head - bizarrely he would rather pour a bucket of cold water over his head than nice warm bubbly water! 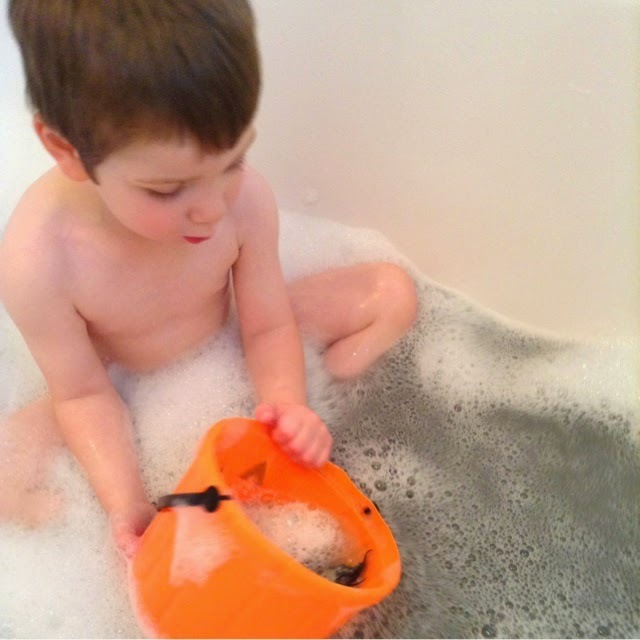 Do you have any tips for getting a little stinker into the bath? 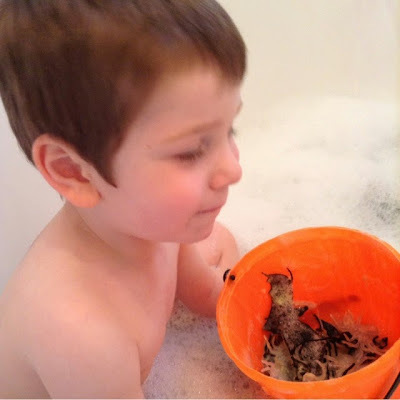 If you enjoyed this activity you may like our space bath post! All of our Halloween activities can be found here. This post is linked up to the new linky which I co-host with Becky at 3princessesand1dude who's hosting this week. This is fab!!! My eldest hates bath's at the moment, will use any excuse he can find not to get in! I think I need to make it more fun, like you have.